The General Statistics page offers a broad overview of the total activity across the Bondora platform. This is a great place for new and existing users alike to get a holistic view of loan performance, loan statuses and borrowing purposes. At the bottom of the page you’ll notice a new Secondary Market Statistics chart. 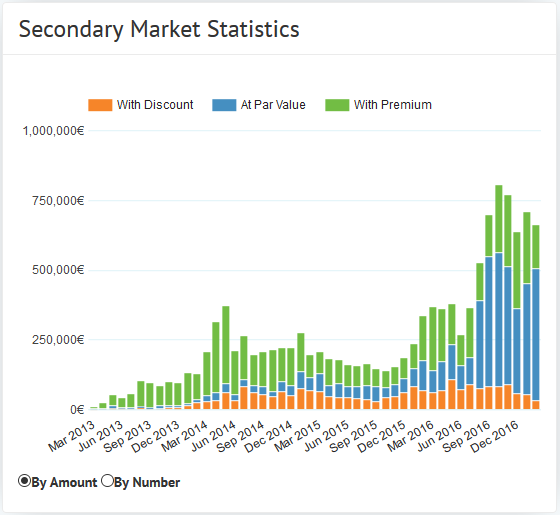 This chart providers investors with an up to date analysis of the activity within our Secondary market. The historical information ranges from March of 2013 right up to the current month. The color breakdown of totals separates par value, discount and premium. This segmentation offers insight to the changing composition of the totals. With this chart, investors will notice that the par value has steadily grown over the years as a proportion of the total. Moreover, the total value has experienced a sharp increase over the last 3+ years. We believe this indicates the robustness of the marketplace lending industry in our regions. Simply hover over the individual bars to see the specific total in euros of each of the three components. You can also toggle to a simplified view by clicking “By Number.” This option illustrates the trend in the total number of investments across each category. As usual we remain committed to a transparent framework that empowers our investors with a range of current, easy to use analytics.